The starting line-ups. Saul replaced Koke after 10mins. This was the sixth Madrid derby of the season, and Atletico remain unbeaten in those matches. This was their most convincing performance to date. Diego Simeone made various changes having rotated for the win over Eibar the previous weekend, with the likes of Juanfran, Miranda, Arda Turan and Gabi all returning, but this was essentially returning to Atletico’s standard first XI. There was an early blow, when Koke limped off, with Saul introduced in his place. Carlo Ancelotti was without both Pepe and Sergio Ramos, which meant Nacho played alongside Raphael Varane at the heart of the defence. Marcelo was also out, so Fabio Coentrao played left-back, while James Rodriguez has joined Luka Modric on the sidelines. Cristiano Ronaldo returned after suspension. Atletico started at a ferocious pace, and took the lead early. 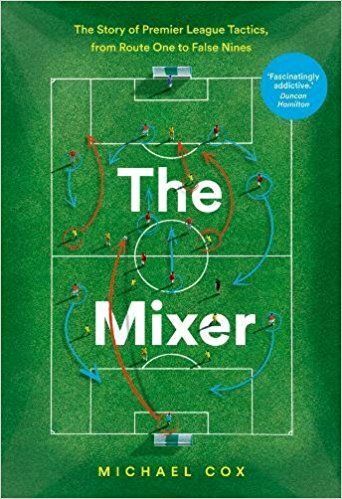 From then, their counter-attacking game worked brilliantly with Real pushing players forward, and the result was never in doubt – the 4-0 scoreline is an entirely accurate reflection of the home side’s dominance. Without the ball, Atletico did everything we’ve come to expect- they are incredibly compact, both from back-to-front, and from side-to-side. The forwards dropped goalside of Toni Kroos and meant all Atletico players were sometimes in their own third of the pitch, while the defenders started with a relatively high defensive line, which allowed the midfielders and attackers to press when necessary. The wide midfielders also tucked in very tight, allowing Real’s full-backs freedom when the ball was elsewhere – although Coentrao and Dani Carvajal were shut down quickly when the ball was played into them. This was nothing new, but the discipline of the attacking players and the work rate of the entire side remains absolutely outstanding. Without the ball, Atletico are Europe’s most impressive side by a considerable distance, and their overall shape remains the template others should look to follow. Real were in their usual 4-3-3 system, although there were interesting differences from their standard approach. The three forwards took up deep positions away from the Atletico centre-backs, as if attempting to make up the numbers in midfield and respond to Atletico’s compactness. Real weren’t overly compact themselves without the ball, but perhaps Ancelotti understood the dangers of them being, at times, 3 v 6 in midfield against Atletico’s tight, narrow shape. Ronaldo started narrow and then drifted wide to the flank when he couldn’t find service, with Juanfran tracking him tightly. 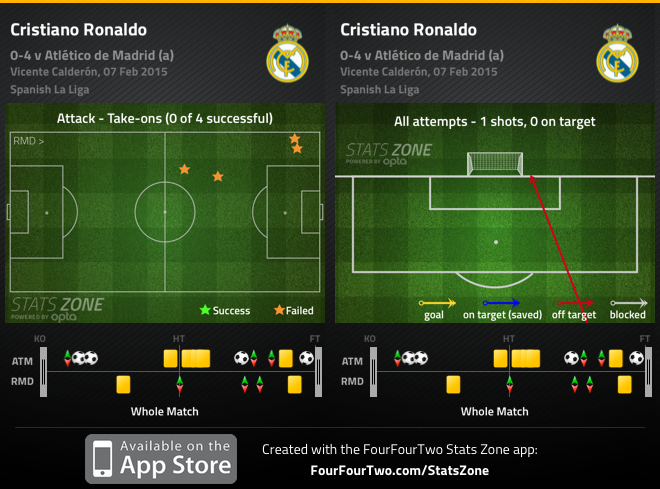 It meant Ronaldo was only ever likely to be receiving passes moving away from goal, rather than going towards it. Karim Benzema was equally quiet, while Gareth Bale moved to the touchline more readily and received passes from Carvajal, but could rarely beat Guilherme Siqueira. In the opening stages, it was notable that Atletico pressed high up the pitch, with young centre-back Nacho under heavy pressure whenever Real attempted to pass out from the back. Atletico can vary their pressing approach, capable of playing either in a deep defensive block or pressing heavily from the front, and here the latter tactic meant Atletico forced turnovers easily. Nacho was panicked in possession and kept knocking hopeful long balls downfield – after around half an hour, the tempo dropped and Nacho was fine on the ball, but until then, his nervousness when under pressure caused cheap losses of possession. The really impressive thing about Atletico, however, was the movement of their players when they won the ball. Although this is naturally a very structured team without possession, they were brilliantly cohesive and fluid at attacking transitions, to the point players were popping up inside the box and you weren’t entirely sure who they were, or where they’d come from. The second goal, with left-back Siqueira crossing for left-sided midfielder Saul, was a particularly good example – it seemed unthinkable that a full-back would be so far forward so soon after possession had been won, but that determination to get into goalscoring positions was well rewarded. The positioning and movement of the two Atletico centre-forwards here was interesting. They started in incredibly deep positions, and then their first movement was generally to the outside, to attack in behind the advancing Real full-backs, dragging Varane and Nacho out of position. 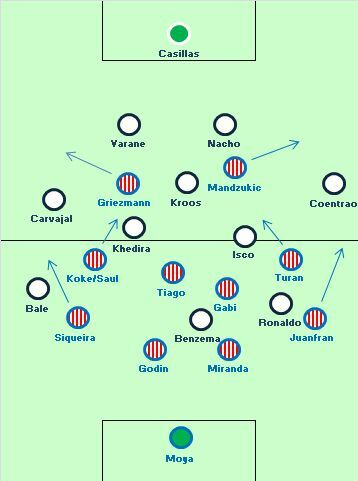 This was highly effective, and while the above diagram shows Mandzukic and Griezmann attacking on different sides, in reality both loved working the channel where Nacho was stationed – he had an extremely difficult game. To compensate for the movement of the forwards, Saul and Turan usually ended up in more central positions, running through the centre and finding space between the lines. Here, Real were often exposed in front of the back four – Tiago was a in a huge amount of space to blast home the opener (albeit from a throw-in situation, and with Iker Casillas making a terrible error). Kroos’ early booking, and the half-time removal of Sami Khedira, didn’t help either. Both Siqueira and Juanfran were extremely brave in a positional sense, pushing past Bale and Ronaldo who showed little interest in tracking back and defending. This was absolutely vital, as it formed a key part of Atletico’s game: creating 2 v 1 and 3 v 2 (and sometimes even 3 v 1) situations in wide areas, and then getting the ball into the box. All four of Atletico’s goals came from either crosses or cut-backs. This is an inexperienced back four by Real’s standards, and at times it was painfully obvious. 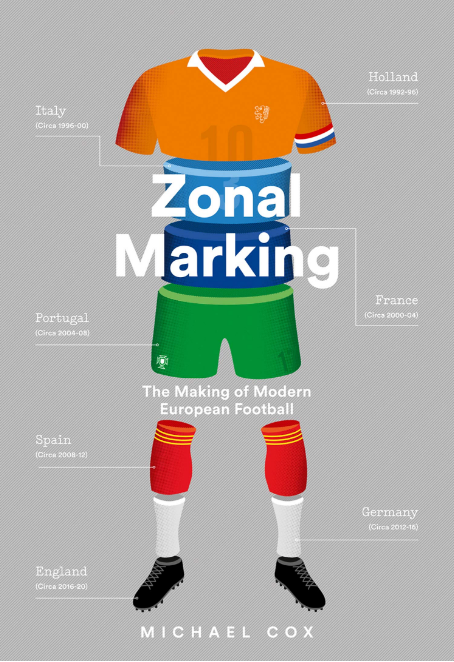 They lost too many aerial challenges, particularly in key zones, and their offside trap looked very dodgy a couple of times – particularly one moment midway through the first half, when Griezmann was wrongly flagged offside when through on goal against Casillas. The back four can’t be blamed entirely, though, and in comparison to Atletico – where all ten outfielders defend strictly – the lack of protection for the defenders was incredible. The three forwards contributed nothing, Isco often drifted out to a wide position and was slow to get back and support Kroos, while Khedira is still off the pace. Considering how well Real defended in a 4-4-2ish system last year (particularly the thrashing of Bayern) it’s strange to see them so open, and so passive without the ball. Ancelotti brought on Jese for Khedira, moving Isco deeper and essentially switching to a 4-2-4 formation, but this changed little. Atletico continued to play in exactly the same way, with Griezmann and Mandzukic (in particular) excelling, and both grabbing goals after half-time. The openness of the Real midfield meant Atletico had plenty of space to play keep-ball, and it was interesting and unusual to see them killing the game through possession, rather than with deep defending. Mandzukic’s second half effort was particularly commendable – as well as scoring, he got back and battled hard. He kept winning both tackles and fouls, and this underlines why Simeone knew he could fit into this system (having played similarly at Bayern under Jupp Heynckes) – he doesn’t have the dynamism of his predecessor Diego Costa, but with Griezmann providing the pace, Mandzukic’s work rate works excellently. 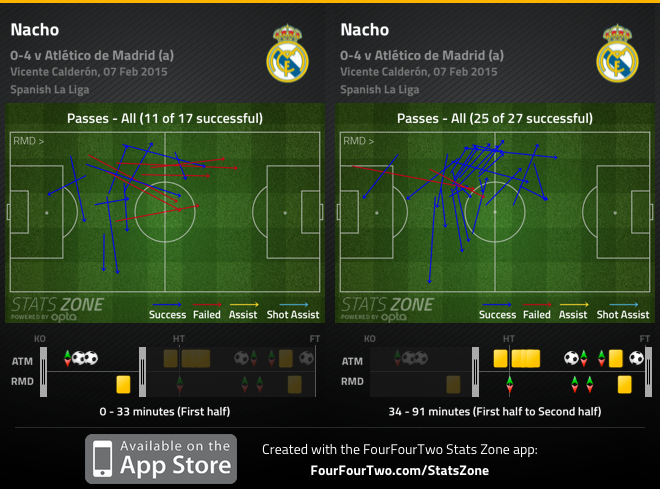 Atletico out-shot Real 17-4, and the away side’s only effort on target came after 80 minutes. Ronaldo, meanwhile, had only one effort – his joint-lowest La Liga total since joining Real in 2015. This was the perfect performance from Atletico – solid when defending, fluid when attacking. Without the ball they dominated the centre of the pitch, with the ball they worked overloads on the flanks. It was a masterful performance in terms of organisation, although the actual tactics are roughly what we’ve come to expect. The movement at attacking transitions was particularly notable, and reminiscent of the excellent Villarreal side from a few years ago. Villarreal mastered 4-4-2 in a possession-based side because movement made the system unpredictable, and while Atletico were most threatening on the break rather than with long spells of possession, they were able to do something similar here. Real were completely outplayed. They weren’t dominant in any zone, at any stage, or at any concept of the game. Injuries are clearly affecting them, but Ancelotti might have to consider how to reformat his side against strong opposition – they barely competed here. With all the money, 6 meetings, no wins with four defeats. Its not done even on football manager. And the reason Atletico lost that final in extra time is because their press-heavy-energy approach leaves them absolutely exhausted by 90 mins, see the Marcelo goal, when 3 defenders just let him literally walk by them, they were too tired to even mark him…. Atletico’s gameplan can work brilliantly, but its has its weakness, which is depleted energy levels in the end of the games…. I’d be interested in seeing how many goals have been scored against Atletico in the past 2 years during the last 15-20 mins of a match…. one particular game was against Sevilla at home last season, where they conceded the equaliser late. But I don’t really remember it happening many times. Yep, on that final Ramos scored the goal of his life (similar to Drogba’s vs Bayern) and knocked the wind out of Atletico. They had Madrid’s number, but were a bit unlucky. They were literally a few seconds away from the most insane victory in quite a while. us usual, excellent analysis. I am already looking forward to the next one. It seems like there is a little typo in the last paragraph before the conclusion: Ronaldo joined Mdrid in 2009. If its something Peps Barcelona did was compete in every match. Nice Analysis Michael. I was hoping you would pick this game. The pictures are a nice touch. I’d love to see more un-fancied teams attempt to replicate the Atletico ’style’. They seem to work so hard and yet are able to keep it up for the full year, unlike the Biesla sides, who tend to get fatigued later in the season. ain’t that exactly the way Real beat Bayern in Munich? Di Maria and Bale moving inside from wide positions, and Ronaldo-Benzema as wide-shifting centre-forwards. The same way Atletico beat RM. Simeone has managed to have 4 players moving centrally when attacking, and still have 4 in wide positions. One may reminisce of Cuper’s Valencia, Brazil ‘94, or Lobanovsky’s Dynamo. But still the most exciting thing on this team is the physical condition of the players. Seeing 8 players attacking but still managing to avoid counter-attacks when losing the ball vs RM (the best or second-best counter-attacking team in Europe) is arguably a case study. Seeing Arda and Saul “doubling” Juanfran and Siqueira in the marking of Bale and Ronaldo is typical of Atletico, but the next moment you see Arda and Saul storming forward and the full-backs overlapping them. They’re the fastest on the ball, and the fastest without it. I think even Ancelotti admired the way Simeone beat him. Liverpool beat Mönchengladbach in 1977 with wide shifting center forwards. I’ve seen it all. they learned it from Miljan Miljanic’s Red Star team of ‘73. I will be very surprised and glad when there is new article in this site. I will find some snacks (or drink), play some nice music and find a new place before I start to read the article. It is like I am going to enjoy a nice thing. Am I the only one who do this? Excellent, as always. Where can I read your analysis on Barça’s performance on Copa del Rey 1/4 final 2nd leg at the Calderon? I can’t even remember how long and what a nice feeling to just simply not care. Where will Simeone move to? Manchester, Bavaria …? Or will he stay in Madrid? 1) Marcelino went away from 4-2-2-2 shape typical for them in Pellegrini/Garrido era and is playing more orthodox and more dynamic 4-4-2 using one (usually Cheryshev) or two wingers (if Jonathan dos Santos isn’t playing in narrow right midfield role). 2) Marcelino’s 4-4-2 is not only quite attacking, but also very solid defensively (10 clean sheets this season in Primera I think). This is very impressive, as Yellow Submarine forwards unlike Mandzukic and Griezmann aren’t helping with defensive work on opposite’s midfielders. now the thing is where real is defeated and there is somebody to blame and it is bale . but if you look at the way real are laid out and the tactics that are deployed by ancelotti and the way team is playing them then there is nobody but ancelotti to blame . the way real are laid out are for nothing but counter attack . just look at the way real were set up bale , benzema and ronaldo are the front three . behind them are ( in this match ) isco on the left and khadeira on the right and kross in the centre in front of the back four . now real have struggled against team who have sat back and invited them to open up . they thrive on quick counters on corners or braking opposition’s offense and launching quick counter . that is why the trio are kept high up the pitch to have a quick run on goal . but it comes to fruition when team make mistake ( generally they make and real have capitalized on it till now ) . but the team has struggled to have any cohesive movement between its players . it has always relied on players brilliance rather than team work . now when teams invite real to open up and play deep denying any space behind the back four that time real had been exposed of placing too many of their players high up the pitch and the counter is on by opposition then these players which are high up the pitch cannot go and help their defense and which leaves them exposed . had ancelotti asked bale and ronaldo to play deeper and help their respective fullbacks on defense and come up the pitch as they build up then i think it would help madrid much as they will have players behind the ball and wont get caught exposed even when they loose the ball and recover quickly . ancelotti needs to change they way real are playing they are just getting one directional and ronaldo needs to show that he is ballon d’or winner not just another ordinary players .he has started to hide in game and just like he did against valencia. You said it yourself, Real thrive on the counter…. and that is because Ronaldo, Benzema, & Bale remain high up the pitch. If you have them track back on defense, then they’re not in a position to counter right away as a trio. read my second comment just below this one . and that’s why Di Maria is missed so much…the keys last season was him and Modric. ust tell me marcotti in the last defeats of real madrid did madrid ever tried to change anything . i mean did they ever play differently or something different . you had suggested a few options but let me in these matches did they change their playing style . people may say that last year it brought great success but then teams and coaches have found a way to play around them . first of all madrid had are made for counter attack and madrid have struggled when teams have sat back and asked them to open up . plus madrid themselves are vulnerable against counter attack . the last match i thought that madrid did something different was the el classico . but then in the first half when madrid played the same way they played the way they had been playing just like they are now were thread to pieces and barca were running riot . madrid were too open and too much space between lines . the second half was where ancelotti went to mouriniho’s style got everybody behind the ball defended narrowly and countered with pace . which won them the game . now in recent game if we look at the way madrid are playing then you could see bale , benzema and ronaldo high up the pitch and have no hand in bringing the ball up and are no use on defense . instead just get them playing deeper bring the ball with their movement so that even if they loose the ball they dont get caught out on counter and press the opposition better . to be honest i havent seen ancelotti try anything different and the team is looking unidirectional and if this continues then forget about the contract extension his job is on the line . i dont know whats wrong.all those pic doesnt even appear here..do this my device problem,or the website problem, or the image hosting problem? Just when you think 4-4-2 is dead along comes Diego Simeone to breath new life into it. Will the bugger ever die? Will a British team ever play it (it is supposed to be our default formation) as well as this?